Burritos are made for leftovers. Fry-up anything you have in the fridge, add some protein, and through it in a tortilla with some cheese and hot sauce and you have a seriously hefty breakfast. The above burrito makes us of all the summer vegetables on my counter and in my crisper. Onions fried with garlic and zucchini, egg fried on the side, a few Tbs. of black beans, a pinch of cumin and a chili pepper for good measure, some leftover Chinese take-out rice, chopped fresh tomato, some fresh parsley and my favorite garlic chive cheddar, all in a Frontier tortilla (hey ‘burque!) with green chilies delivered by my aunt. 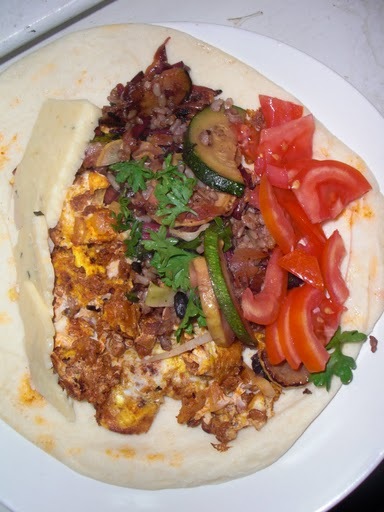 A burrito like this is a brunch burrito, and more!